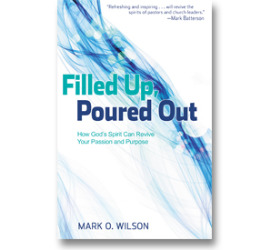 My new book, Filled Up, Poured Out: How God's Spirit Can Revive Your Passion and Purpose, will be released in April of 2012, and is currently available for pre-order at Wesleyan Publishing House and Amazon. "I heartily endorse this book, Filled Up, Poured Out. It is well-written. (1) It is filled with Scripture, so it is His Word, more than only his word. (2) It has a lot of one-line quotes, sprinkled throughout the book. These quotes come from dozens of men and women. Some come from past history and some are current. (3) It makes use of many personal illustrations from Pastor Wilson's life and ministry. The book has warmed my heart. It has stirred my soul. It will bless and encourage readers everywhere."